It was no surprise when the phone rang in the Dan-Inject Dart Guns’ office: the Dan-Inject brand was preferred over other vendors by a non-profit agency to help in the recovery of threatened species in the recent oil spill. The Dan-Inject system is known worldwide for it’s HUMANE tranquilization of wild and domesticated animals. For this reason, it was chosen to help in the rescue of animals in one of the worst oil spills in recent history. Animals are tranquilized and transported to safety for their clean up and protection. And safety is the primary reason that Dan-Inject Dart Guns was chosen to help in this relief effort. The unmatched aspects of the Dan-Inject self pressurizing dart, side ported needles and re-usability, make the Dan-Inject product the preferred choice for renowned professionals world wide. The Dan-Inject darts can safely be darted as close as 2 feet from an animal. 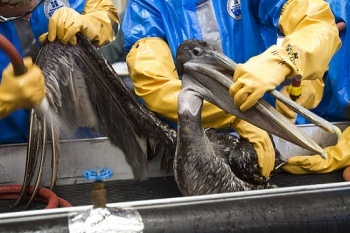 Yes, indeed, the phone call into the offices of Dan-Inject Dart Guns asking for immobilization equipment to help rescue wildlife from the 2010 Gulf of Mexico oil spill was no surprise at all.